CiM Prussian Blue is the rich, deep navy blue colour that I've been waiting for without even realizing how much I wanted it. It's darker than Lapis Cobalt, it strikes even darker, and when it strikes it can develop a greenish cast that makes it a similar colour to Lauscha Steel Blue. It's wonderful, and I love it. I have a feeling it won't last long, and who knows whether or not it will be reproduced, so I'm going to have to break my self-imposed glass buying hiatus and get a few pounds of this. 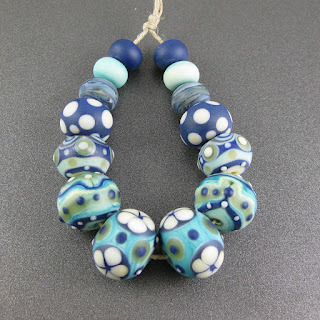 You can see the plain colour in self-coloured beads. 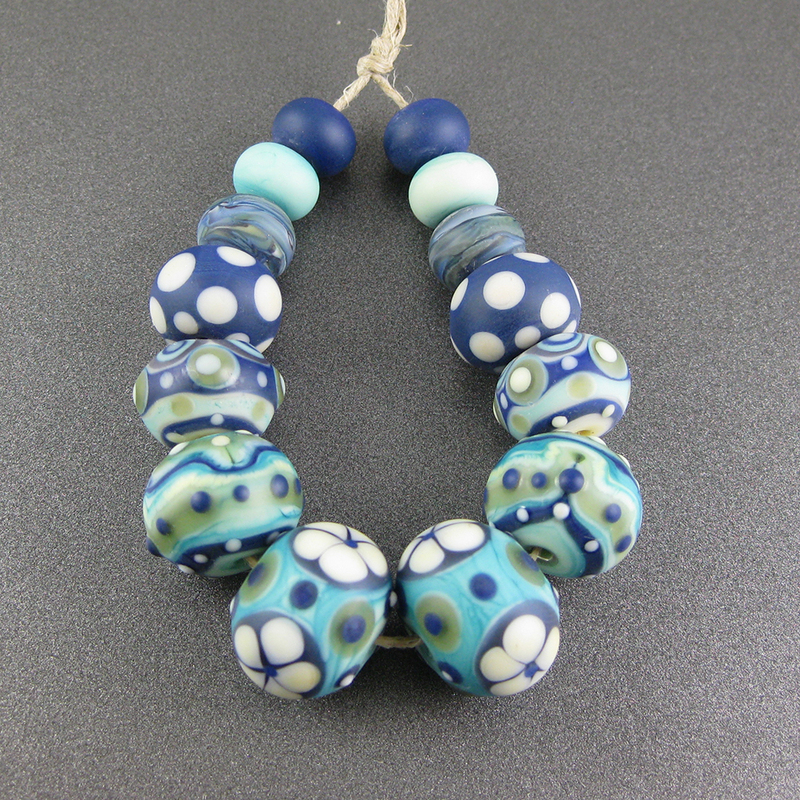 The bead I reduced is darker, because this colour darkens with repeated heating and cooling. It could also be because of the reducing flame, but it is hard to say for sure without using it a lot more. Here I've compared Prussian Blue to some of the other blues out there. 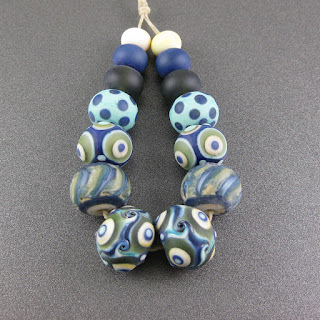 Effetre Navy Blue, CiM Class M Planet (another awesome blue limited run), Effetre Lapis Cobalt, Lauscha Steel Blue, and Vetrofond Light Cobalt. 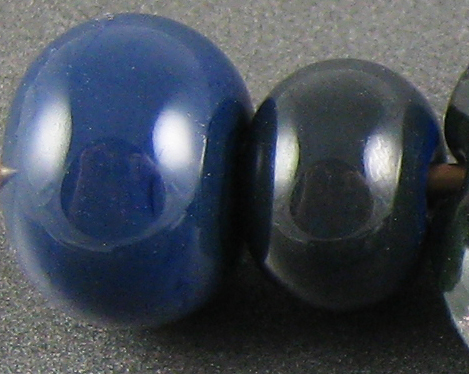 Prussian Blue is darker than Lapis Cobalt, deeper in tone, and strikes to a colour not unlike Steel Blue with repeated heating and cooling and/or the addition of silver. Add silver to Prussian blue and you get a wonderland of lacy, silvery blueness. When the silver is reduced and encased, it turns into a lacy white blanket with a blue haze. 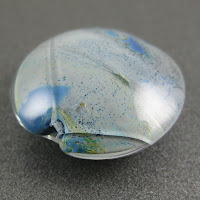 My Prussian Blue bead where I encased the reduced silver leaf cracked, though, and I'm not 100% sure why. Because the cracks seem to originate at the hole, it's possible that this is a thermal crack. 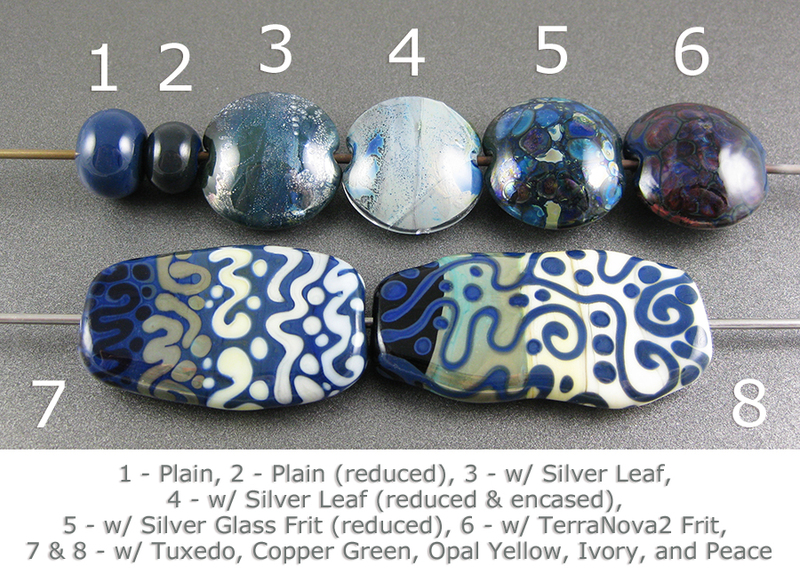 I think I encased this bead with Zephyr, so it's also possible that there was a viscosity clash between the Zephyr and Prussian Blue, maybe created or exacerbated by the silver leaf I used. Kandice Seeber successfully encased Prussian Blue with Zephyr without any cracking, but her beads did not include silver and were likely smaller than this one. 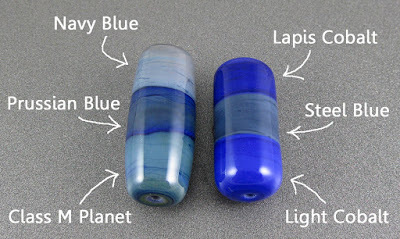 When I get more Prussian Blue, I need to explore this further. 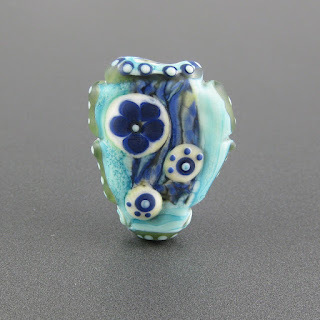 Silver glass likes Prussian Blue, too. I got very pretty blues out of my reduction frit on top of this colour, and the striking silver glass frit got a nice starting strike. Not a miraculous base for TerraNova2 like Dark Grass Green was, but promising. Around Tuxedo dots and lines on top of Prussian Blue, the Prussian Blue shows up in light halos. On top of Tuxedo, Prussian Blue separates. On top of Prussian Blue, Copper Green separates. 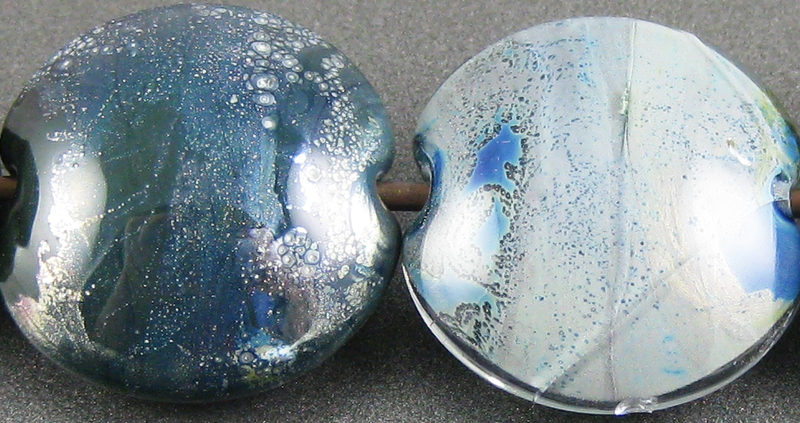 Nothing interesting happens when you put the Copper Green on top of Prussian Blue, although it is may be notable how stubbornly greyish the Copper Green becomes when used with Prussian Blue. This is definitely not one of the colours that helps Copper Green not develop that sheen. 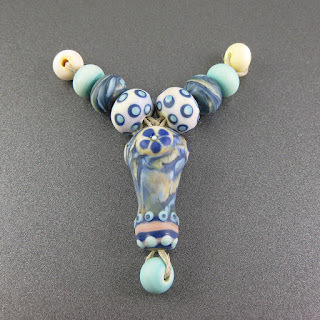 Opal Yellow and Prussian Blue don't really have a reaction, but you can see in the left bead that Prussian Blue bled into the Opal Yellow stringerwork in places. 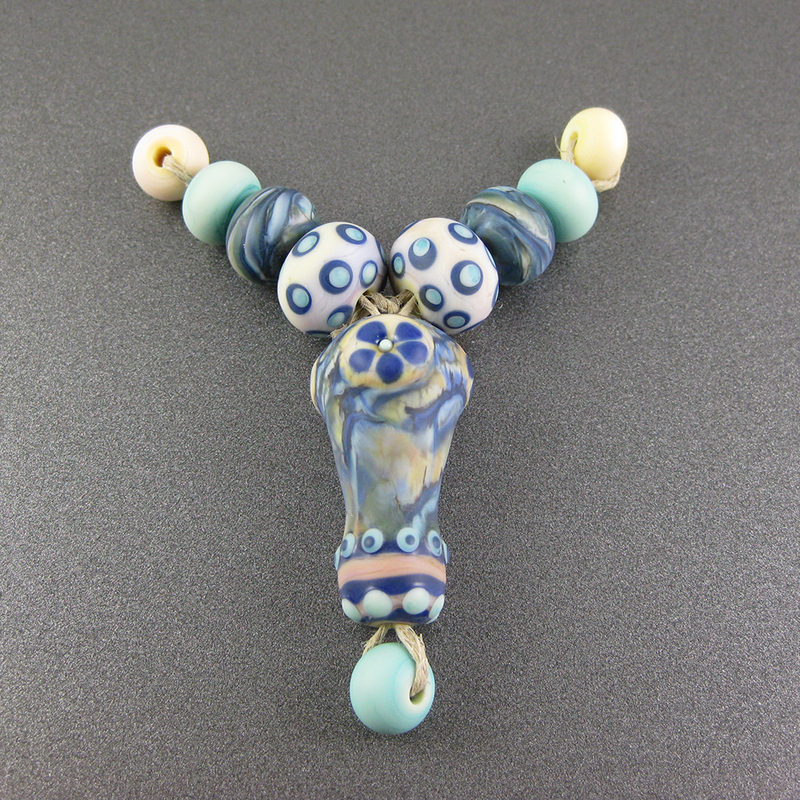 Ivory separates on top of Prussian Blue. This combination does not produce the reciprocal dark line reaction that I was expecting. Prussian Blue and Peace don't noticeably react with one another. 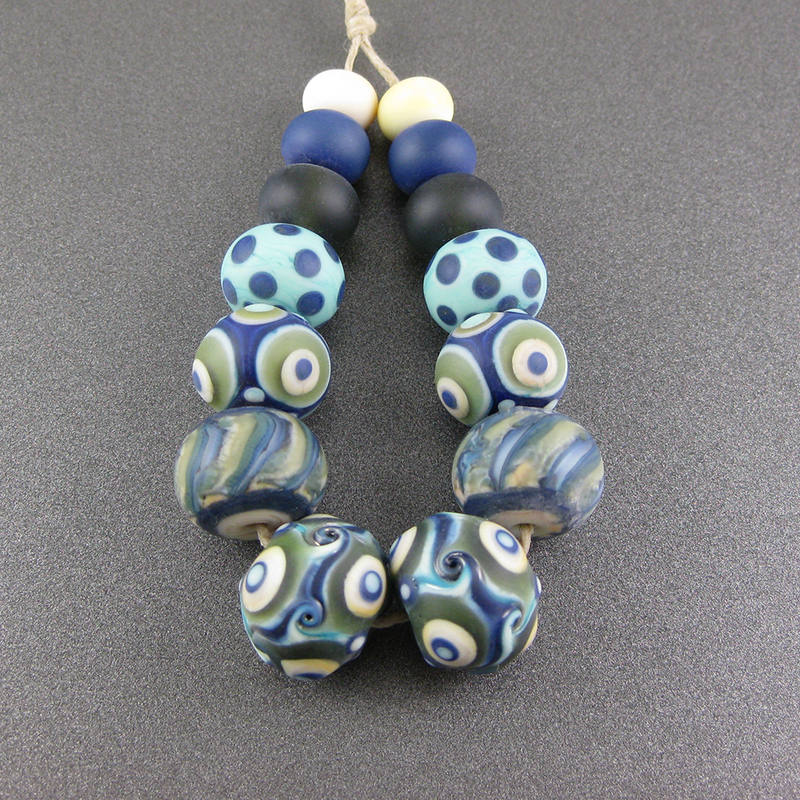 These beads / sets were all made with Prussian Blue.